You got it girl! Today has been a near disaster. 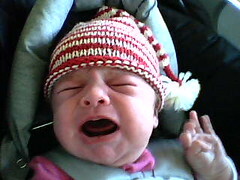 I think I’ve had the second worst night of sleep since we’ve been home with Lorelai – she was up so often! This morning then was a little rough, as I was overtired (poor Dan had to feel the brunt of my one word answers and grunts). When I finally got the little one back down, I started wrapping gifts and Jackson kept finding things to bark at / about. GRR. I put him in his room, fed the baby, and then we went out shopping down at the town green. It’s taking some getting used to balancing packages and a baby carrier and my car keys. Bleh. My hair is a disaster too. On the positive side, Lorelai got many compliments on her hat, and one lady told me I shouldn’t have a 3 week old out and about. Sorry honey, I need fresh air, and the little one does too. Got home, put the baby down. She sleeps (yay!) So I try to call Dell as my computer was not booting up and I got a funky error message. I try to knit while on the phone – gotta finish a pedicure sock! In the middle of my call to Dell (about 45 minutes in) Lori wakes up and I feed her while I’m on the phone (my neck and back hurt! I have lost any good posture I once had). Then the tech guy wants me to get the reinstallation cds, and did I have a lot of data on my hard drive? Um, I have a newborn to take care of so I don’t have the cds on hand and yes I have files I want to keep. He says he’ll call back in an hour. It’s been 1.5 hours and no word from him. I think it’ll just be easier to bring my computer in to a local shop and let them deal with it, save my files and get the computer working again. Or maybe I should just say screw it and consider investing in a new laptop? Sigh. In the midst of that I’m wrapping presents, trying to get the house in order for my mom’s birthday dinner tomorrow (we’re having turkey and smashed potatoes. that’s all I know. Food shopping will get done tomorrow I guess.) Crazy. I love Christmas and can’t wait to have this first holiday with our baby and all, but I’m looking forward to December 26… is that awful? From the sound of all of this, you are pretty normal. Bad hair and no sleep are part of the baby package. Just remember most mothers go through the same thing. Before you know it she won’t be a baby more and you will miss these days. Plus, how cute is she in that hat. HAPPY HOLIDAYS.. It will all get better soon! Her hat is adorable! Wish I head read that before I saw you yesterday. You are doing great, and I can’t wait till the day after christmas. Maybe we can be real rebels and take the little one to her first yarn store whiel I am home. YOu know the ladies at YDU will go NUTS over her. Get used to the messy hair and unsolicited advice. Oh, and spit up and/or food always being on your shirt.Give yourself credit. The first 8 weeks don’t last forever… Thank god. She’s soooo cute! Everyone here has great advice to you, too. Sit with your darling baby and do not worry about cleaning anything. I’m a mom of two, and the baby time goes by way too fast – when it’s over. I wish I would have stopped to enjoy it more. Most days I just wished they would grow up faster so I could get a shower!